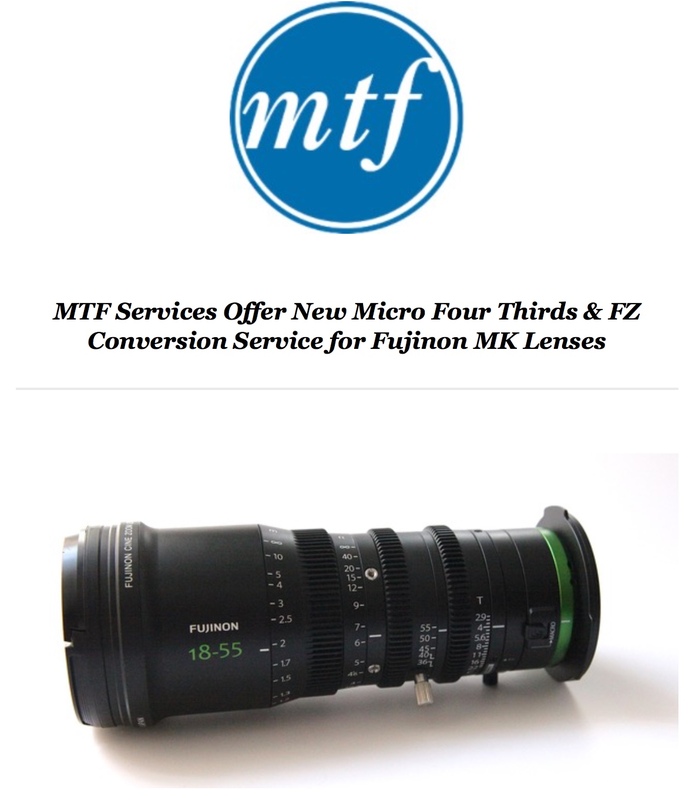 MTF Services to provide 4/3rds and FZ mount options for Fujinon MK lenses. In addition to the recent announcement from Duclos, MTF services in the UK have just announced that they will be introducing a conversion service for the popular new Fujinon MK zoom lenses. Currently these lenses are E-Mount only, but MTF will be producing kits to convert the lens mounts so that they can be used with cameras that use the micro 4/3rds mount as well as the Sony FZ mount. This is great news for owners of Sony’s F5 and F55 cameras. Mike Tapa, Managing Director at MTF Services said: “Since these excellent lenses from Fujinon were launched earlier this year, we’ve had more and more of our customers asking for us to produce a solution to open up the use of the MK lenses for use across a broader range of camera bodies. We’re now pleased to announce that we have designed brand-new adapter mounts for both micro four thirds and FZ systems to work seamlessly with both the 18-55mm and 50-135mm lenses. Fitting the new mount options for the Fujinon MK lenses will be offered as a service from the team at MTF Services. Simply ship your lens over to MTF’s London-based workshop, and the team will fit your preferred mount before shipping back to you, fully tested, professionally adapted, cleaned and ready for use before being safely couriered back to your door. Image quality with B4 ENG lenses on large sensor cameras. 2/3″ B4 lens on the FS700via the MTF adapter. This is something that comes up a lot and I get many questions about. In part because I designed the MTF B4 to Canon, FZ and E-Mount adapters. Budget adapters that allow you to use a 2/3″ B4 ENG lens on a Super 35mm sensor by using the lenses 2x extender or on a center crop sensor without the 2x. The question is… what will the pictures look like? The answer is… it depends on the lens. Not a very helpful answer perhaps, but that’s the truth of it. Different lenses perform very differently. For a start I would say forget 4K. At best these lenses are suitable for HD and you want to have a great HD lens if you want good HD pictures. But what about the “look” of the images? My experience is that if you put a wide range ENG zoom on a S35mm camera the look that you get can be best described as “2/3″ ENG look with maybe shallow depth of field”. Lets face it, ENG lenses are full of compromises. To get those great big zoom ranges with par-focal focus there are a lot of glass elements in those lenses. Lot’s of elements means lots of places where CA and flare can occur. The end result is often a lowering of contrast and color fringing on hard edges, the very same look that we are used to seeing on 2/3″ cameras. Typical cine or DSLR lenses tend to have simpler optical designs. Prime lenses are normally sharper and show better contrast with less flare than zooms due to there simpler internal design. So don’t expect to put a typical B4 ENG lens on your S35mm camcorder and still have that crisp, high contrast digital cinema look. Of course B4 zooms are handy for the ability to zoom in and out through huge ranges while holding focus. So an adapter and lens may well make your S35mm camera more versatile. But if you want the best possible images stick to cine style lenses, DSLR lenses or zooms designed for S35. Metabones FZ to Canon Mount. Metabones Sony FZ to Canon EF adapter. There was one of these at IBC last year. A new version appeared again this year at IBC and it’s really nice. I so hope that this becomes a real product. It fits the Sony PMW-F5 and PMW-F55 cameras (and I must assume the PMW-F3 too). It takes it’s power from the camera and will control a Canon EF lens. Aperture is controlled by a large aperture ring which has clear aperture marking visible at the side of the adapter. No fiddly knobs or dials, no power cable and a real aperture scale. In addition I believe you will get an aperture display in the viewfinder. The EF Lens mount features a large locking ring so the lens won’t twist or rotate once mounted, something essential if you are going to use a follow focus. This version was much nicer than the one shown last year. I really hope it becomes a real product as I’d like one for my F5. Metabones FZ to Canon EF adapter showing the locking mount system. Commlite full frame EF to NEX lens mount adapter. My old Metabones MK1 adapter is not suitable for full frame lenses on the new Sony A7s. So in anticipation of the arrival of my A7s I ordered a cheap CommLite full frame autofocus ready adapter on ebay. This adapter (CN-EF-NEX) was only $90 USD so I thought I would give it a try, much cheaper than the metabones. To be honest I wasn’t expecting much, but now I have the adapter in my hands I am pleasantly surprised. It appears well made and very solid. It even carries a CE mark. It works just fine on my NEX5N and FS700. On the NEX5N I have working autofocus. If the lens has image stabilisation this works too. I have tried a wide variety of Sigma and Tamron Canon EF lenses with it and they all work. Even my new Tamron 16-300mm works with this adapter, this lens doesn’t work with a number of other adapter. Autofocus is a little slow, especially if the light is bad. Having not used the MK3 Metabones I don’t know how this compares but certainly this adapter works and is quite useable. It’s said to be compatible with full frame lenses on the A7, but as yet I have not been able to test this. The little mounting post is easily and quickly removable, but a real boon on the NEX5N with bigger lenses. For the price, you can’t go far wrong, really quite impressed considering how little it cost. Video overview of MTF Services B4 2/3″ to super35mm adapter. In this video I take a look at the MTF Services (http://www.lensadapter.com) B4 2/3″ to super35 mm lens adapter. This adapter allows you to use a conventional 2/3″ ENG zoom lens on most video capable cameras that have a Super35 sized sensor or APS-C sized sensor. It comes in two parts, the optical converter (the expensive bit) and a simple low cost lens mount adapter ring. Adapters are available to work with the Sony PMW-F3, Sony E-Mount (FS100, FS700, EA50, NEX5 etc) as well as Canon EF (C100, C300, C500, 7D, 550D etc). To work correctly the lens must have a 2x extender. All is explained in the video. Metabones EF to E-Mount smart adapter. The new $400 Metabones EF to E-Mount smart adapter allows you to use Canon EF mount lenses on almost any camera with an E-Mount. So that means cameras like the FS100, VG10, VG20 and the NEX series stills cameras. I’ve been trying to get hold of one of these for some time, but they have always been out of stock due to popular demand. However I was lucky enough to track one down from a UK dealer a couple of weeks ago. It is a small compact device, there are no wires, cables or remote control boxes so it couldn’t be simpler to use. Simply attach it to the Sony E-Mount and then attach your Canon EF lenses to the adapter. The camera will then control the iris just as it would with a Sony lens. So in the case of a FS100 or FS700 the iris wheel will control the iris with an accurate display of the iris setting on the cameras LCD screen. You can also use the auto iris functions. For quick focus checks there is a small button on the barrel of the adapter that momentarily fully opens the iris so you have minimum depth of field, which makes it easier to see if you are in focus. The adapter doesn’t work with auto focus so no focus functions, but it does allow any image stabilisation built into the lens to work. It works with the vast majority of lenses although there are a few that don’t work or have some limitations, best to check the Metabones web site for details. I really like this adapter for it’s simplicity and transparent operation, you really don’t know it’s there. Just wish they could do one for the Sony F3. Coming Soon: A review of the new Transvideo PMW-F3 base plate that completely replaces the underside of the F3 with a really nice bottom end and of course the Alphatron EVF-035W review. Triad PL to E-Mount Adapter. A PL adapter for the FS100 and FS700. A little while back I was loaned a Triad PL to E-Mount adapter for review. E-Mount is the Sony mount used on the NEX-FS100, NEX-FS700 as well as The VG10, VG20 and NEX stills cameras. While more and more E-Mount lenses are becoming available from Sony and other DSLR lens manufacturers there will be many times when something more suitable for video work might be needed. One of the big issues with DSLR lenses is the very small amount of rotation on the focus ring to go from near to far, often only 45 degrees which makes accurate focus tricky. A good PL mount lens will have over 180 degrees of rotation. PL has been the industry standard for movie cameras for years and most rental companies have large ranges of PL lenses to choose from. So the ability to be able to use a PL lens on any super 35mm camcorder is always welcome. While I use DSLR lenses on my cameras for my day to day shoots, if I am doing a high end production such as a commercial then I will hire in the appropriate PL lenses for the job. Sony’s soon to be released FS700 is a camera that will, I’m sure end up getting used for many commercials as slow motion is a technique widely used to show off new products or ideas. As a result there will be many time in the future where I will need a PL adapter. The Triad adapter showing the Flange Back adjustment ring. The Triad adapter is very solidly made, machined from high grade alloy with stainless steel and chrome plated steel inserts. One of the very nice features is that the adapter has a built in adjustment for the back focus distance. A locking outer ring on the adapter can be rotated to alter the physical distance between the PL receptor and the E-Mount bayonet. This will allow the user to calibrate the back focus or flange back distance so that the focus witness marks on any PL lenses will be 100% accurate. It will also ensure that PL zooms will track focus correctly through the entire zoom range. As the FS100 and FS700 don’t have built in back focus adjustments this really is a vital thing to have. The Sony E-mount was only designed to support the weight of light weight DSLR type lenses so the Triad adapter has a support post that can be attached to 15mm or 19mm rails (via a suitable bracket) to help carry the weight of heavy PL lenses without over-stressing the cameras E-Mount. One note from Triad is that the Sony PL lenses supplied with the kit that comes with the PMW-F3 do not fit this adapter. There are quite a few PL mounts that don’t accept the Sony PL lenses without shaving a bit of metal from the Sony lenses mount. So this isn’t a flaw with the Triad adapter, it’s a non standard quirk of the Sony PL lenses. There’s really not much more to say about this mount. It’s well made and does what it designed to do. Frame Grabs from MTF B4 2/3″ to Canon C300, 7D, 550D, Sony F3, FS100 etc adapter. Canon J16 SD 2/3" lens on a Canon C300, Wide. I’ve been asked a couple of times for some frame grabs shot with one of the MTF B4 to super 35MM adapters that I designed. Well, here they are. Shot on a Canon C300 fitted with the adapter and an old standard definition Canon J16 zoom lens. It was late in the day when I shot this so it’s not showing the adapter in its best light and of course an HD lens would be even better. Canon J16 2/3" SD zoom on a Canon C300, Tele. Click on the thumbnails to view a larger image or the full resolution image. I love the fact that even when using a super35mm sensor you can still have this great par-focal zoom range. Put a 20x ENG zoom and you can get both wider and closer! MTF are making my lens adapter. So here it is. The first one off the CNC machine with many more to follow in the next few days. There will be an additional lens support bracket on it by the time they ship and of course they will be completely anodised. It requires the use of a 2/3″ lens with a 2x extender. Optical performance depends on that of the lens, so an HD lens is highly recommended, however if you have an old SD lens kicking around it may be useable. When using the adapter you use the 2x extender. The total magnification is 2.5x so a 7.6mm to 152mm 20x ENG lens becomes a 19mm to 380mm lens. There is also a 2.5 stop light loss so a f1.8 lens becomes a f6 lens. The adapter will come as a kit for the PMW-F3 or FS100 for £1150. If you wish to use it on a Canon DSLR with an APS-C sized sensor (7D, 550d, T2i etc) the price is £950. Can be used on an APSC DSLR as well! Adaptimax Lens Mount Adapters for PMW-F3, Canon and Nikon. I was sent a couple of Adaptimax lens mount adapters to test on my PMW-F3. I have used some of their EX3 adapters in the past and these worked very well. The new PMW-F3 adapters are finished with a very nice hard black anodised finish and look very smart indeed. I had 3 adapters to try, one F3 to Canon and two F3 to Nikon adapters. The Canon adapter is a “dumb” adapter, so there is no way to control the lenses iris. If your using Canon lenses this means using a DSLR body to set the iris before using the lens on the F3. Obviously this is not ideal, but you do have to consider that there is a massive range of lenses that can be used with this Canon adapter via a secondary adapter ring. Canon’s flange back distance (the sensor to lens distance) is the shortest in the DSLR world. So this means that there is space to adapt to other lens mounts with longer flange back distances such as M42, Nikon, Pentax, Pentacon etc. This opens up a whole world of possibilities as now you can use those nice M42 Zeiss lenses that can be picked up cheap on ebay by adding a cheap M42 to Canon adapter. Nikon 50mm f1.8 with Adaptimax F3 Mount. If you have already invested in Nikon fit glass then you can use a Nikon to Canon adapter or you can use one of Adaptimax’s purpose built F3 to Nikon adapters. There are two varieties, the original Adaptimax and the Adaptimax Plus. The Plus version includes a long screw that pushes the iris pin on the rear of the lens to give you iris control even when the lens does not have an iris ring. While this is not as elegant as MTF Services rotating adapter barrel, it works fine and the simplicity of the design means the adapter is a little cheaper. The standard version has no iris control, so you need to ensure your lens has a proper iris ring. Priced at £255 for the standard adapters and £265 for the plus versions these are good value for money.